LDRA – Liverpool Data Research Associates is the leading provider of automated software verification, source code analysis and test tools. LDRA Testbed, one of major part of LDRA tool suites provides the core static and dynamic analysis and enables developers to visualize coding standards compliance and quality metrics, thus addressing flaws at the source code level. The integration of LDRA tools with Kovair Omnibus platform fuels the development of Safety Critical Software and maximizes the value of LDRA tool investment. Together with Kovair Application and Omnibus integration technology, LDRA provides a Continuous Integration (CI) platform to its users that automates and manages the build process for large-scale, system-level software projects. In this video, you will learn how Kovair Omnibus facilitates bi-directional integration between LDRA Testbed and Kovair ALM and in the process connects other best-of-breed tools in the ecosystem. It includes a demo integration flow between DOORS, RTRT, ClearCase, LDRA and JIRA powered by Kovair ALM and Omnibus Integration Platform. With this integration in place, organizations can enforce LDRA compliance test as a mandatory step for their development teams operating in a multi-tool environment, and thus ensures that development errors are identified early in the lifecycle and resolved at the source code level itself, even before they are checked-in into source control repository and the build process continues. Kovair Omnibus applies a unique mechanism that restricts developers to check-in their codes into an SCM tool without running them through LDRA analysis tests. Only if the results of the analyses turn out ‘Pass’, codes can be checked in successfully followed by automatic build and testing – the way to achieve Continuous Integration. Kovair facilitates this integration solution with the help of Kovair LDRA Integration Adapter/ Connector and Kovair ClearCase Plug-in for LDRA. 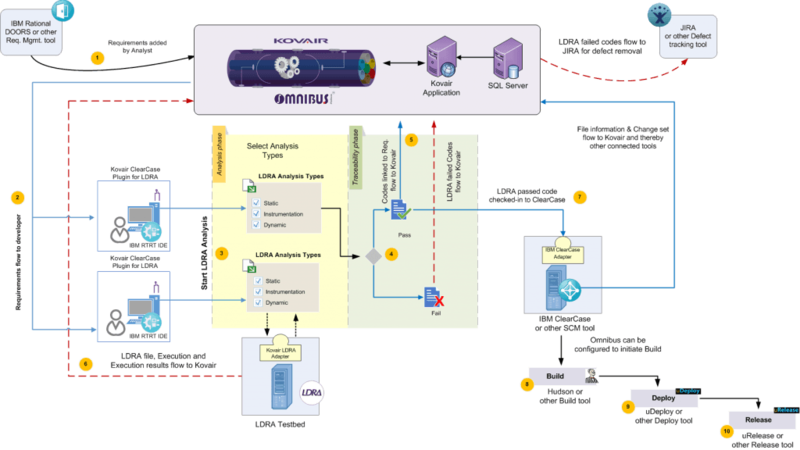 The adapter provides bi-directional synchronization between LDRA Testbed and Kovair Omnibus, thus resulting in data flow to and fro from other development tools via Omnibus. The ClearCase Plug-in for LDRA installed locally in developer’s system pulls in code files from ClearCase during code check-in and then pushes them to LDRA tool via Kovair LDRA integration adapter. Once the LDRA tests are done, users can view the execution results from the plug-in itself. As the associated data flows to Kovair Omnibus centralized repository, it provides a vivid picture of the execution. The overall status can also be pushed to other desired tools like DOORS. Kovair LDRA integration adapter currently supports 9.4.6 version of LDRA Testbed. One can manage the entire development process starting from importing requirements from a requirement management tool to developing code in an IDE, analyzing coding standards in LDRA, code check-in into an SCM tool to managing builds and deployment in an integrated tool setup. In real life scenario, it is often seen that developers due to many unavoidable circumstances end up checking in erroneous codes into an SCM tool that do not adhere to the quality standards defined at project level. The results are obvious defects that are identified later when the build fails during automated testing. Avoiding code errors early in the development stage causes rework, incremental issues, and delivery delays. It is also important that developers are able to perform all their development steps including LDRA analysis from within their preferred tool environment and there is no communication barrier between the participating tools, since automating development progress is the ultimate objective. In a common development setup, Business Analyst manages Requirements in any Requirement management tool like IBM DOORS; Developer writes code in IDE like IBM RTRT and check-ins codes in SCM tool like IBM ClearCase; analyzes Source Code quality in LDRA Testbed; tracks Defects in a defect management tool like Atlassian JIRA and manages Builds in Jenkins. All these best-of-breed tools for different development functions are not connected to each other resulting in frequent manual interventions to complete the build process, starting from requirements analysis, code check-in to code analysis, repair of erroneous codes to successful build. Developer does not know what source codes are being analyzed in LDRA pertaining to which requirements in IBM DOORS or which defects raised in JIRA. Developer needs to login to each tool separately to perform code check-ins, LDRA analysis or to trigger build process. Developer needs to manually enter the failed LDRA tested codes to JIRA for defect removal and then again checks-in the codes to IBM ClearCase for further code quality analysis. There are no automated flows of information across the code analysis, code repair to successful build processes resulting in inefficiency, productivity loss and delivery delays. Project manager does not have a single window view of development artifacts spanning across tools including LDRA code review results. Kovair’s powerful report and process engine builds complete systems with quality management and automated testing capability. By linking the LDRA tool suite to Omnibus, the platform can invoke the LDRA tool suite to perform analysis, track test and verification fulfillment, and assess overall improvements or regressions in code quality in real-time manner. One can also use Kovair Application as a central data repository to view all tool generated data including LDRA at one place and establish traceability relationships between any cross-tool artifacts as per the need. 1. Business analyst adds a new Requirement in IBM DOORS. 2. The Requirements flow to developer for which he or she writes codes in IBM RTRT IDE. 3. Before codes are checked-in in IBM ClearCase, developer is prompted to analyze code quality in LDRA tool. 4. If the codes pass LDRA compliance test and the results turn out as ‘Pass’, developer can link the tested code files to the original Requirements in DOORS or defects in JIRA so that project manager can view Requirements and Defects traceability from within DOORS itself. 5. Once linked to the Requirements or Defects, the codes get successfully checked-in in IBM ClearCase. 6. On successful check-in, one can also configure Omnibus to initiate Build process in Jenkins, followed by automated testing and Release in other tools. 7. If LDRA test turns out as ‘Fail’, the code check-in process automatically gets aborted and defects are raised automatically. 8. The defects flow to any other defect management tool like JIRA through Omnibus for required fixes. 9. Developer check-ins the fixed codes and then repeats the LDRA test for analysis. In the above Use Case, Kovair Omnibus Integration Platform along with its LDRA adapter/connector facilitates LDRA users in various ways as mentioned below. Developers do not need to login to multiple tools to monitor the progress status of their development objects or LDRA results. Everything can be viewed from within the IDE itself. It will be done automatically based on a rule (File based configuration or metadata). Once check-in is fired in IBM ClearCase, Kovair Omnibus bifurcates the check-in and sends the file to LDRA (in local machine) for analysis. Once the codes pass the analysis steps, they are checked in with a comment that they have passed the following phases of analysis. If the analysis fails in LDRA, the code check-in is aborted. Once code check-in is successful, the Jenkins’s Build will be automatically fired for the project code that has been checked in to verify the build stability. This insures that the code has no impact on the overall product stability. When integrated with Kovair ALM platform, off-site managers can easily track progress and quality of Build from within Kovair without logging into Jenkins or other tools. Similarly, defects raised during Build failure automatically flow to any defect management tool like JIRA connected through Omnibus. Developer seeking to check-in code in ClearCase does not necessarily need to login to LDRA tool separately to start the code analysis. Once Kovair ClearCase Plug-in for LDRA is installed on each of the Developer’s system, it automatically pulls the code files from developer’s machine and sends them to LDRA for code compliance test. Developer also gets a quick access to LDRA results without entering into the tool. However, having the LDRA tool installed in each developer’s system is a prerequisite. When a developer intends to check-in code in IBM CC, Kovair ClearCase plug-in prompts him or her with a dialog box showing multiple options to select phases of analysis like Static analysis, Instrumentation analysis and Dymanic analysis. Developers can link LDRA compliant codes to the original requirements or defects for which they have written codes. This helps project manager understand what codes have successfully passed the LDRA test for which requirements coming from DOORS or which defects raised in JIRA, and how many codes are yet to go through the LDRA compliance test in order to complete the build process successfully. The management can see the entire chain of development artifacts from Requirements -> Code File -> Code analysis result (HTML) -> Defect -> Build -> Build Result. The Kovair Omnibus Adapter for LDRA integration is already available for enterprise use. The live demonstration of the integration scenario can be scheduled in advance and run through web conferences by contacting the Kovair Omnibus Team.